Medical and community volunteers play an important role at AccessOC and assist in so many ways. To express our appreciation, we hosted a 10th Year Anniversary Volunteer Recognition event on November 4, 2017 on a Hornblower Cruise ship in Newport Beach. Our guests of honor included doctors, nurses, hospital administrators and community volunteers. All guests received a certificate of appreciation, along with a thank you bag, for the amazing work they contributed in making an incredible impact on patients' lives. AccessOC would like to give special thanks to the companies that donated gifts prizes that some lucky guests won including Disneyland tickets and Knott’s Berry Farm tickets. Special thanks as well to Simply the Cupcake Store and Glee Donuts & Burgers for generously donating desserts for our event. We appreciate photographer Lia Stude at Werkit Photo, for taking pictures at the event. 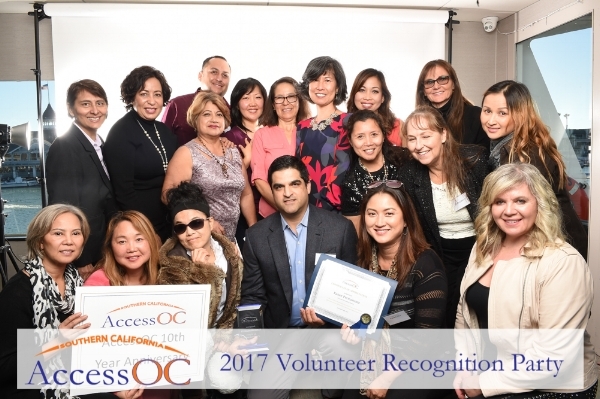 AccessOC is truly grateful for the time and dedication of our volunteers throughout these past ten years and looks forward to more years of building bridges to health. Left to right: Jonathon Kellerman, Allergan Foundation board member and Executive VP, Global Chief Compliance Officer; Susan Stone, Allergan Foundation Board Member and Executive Director, Alliance Advocacy; Noemi Grabiel, AccessOC Program Manager; Christina Catabay, Illumination Foundation Grant Writer; Gwyn Grenrock, Executive Director of The Allergan Foundation; and Alex Kelly, Allergan Foundation President and Executive VP, Chief Communications Officer. AccessOC is grateful for The Allergan Foundation’s continued philanthropic support of our Outpatient Surgery Program. The mission of The Allergan Foundation is to make a positive and lasting impact on the community. The Allergan Foundation is dedicated to addressing unmet needs in its community by supporting initiatives that improve patient diagnosis, treatment, care, and quality of life, or to promote access to quality healthcare. On April 29, 2017, AccessOC partnered with St. Jude Medical Center for surgery day! As a thank you to all volunteers, here is a short video. AccessOC is celebrating its 10th year of partnership with St Jude Medical Center! AccessOC is proud to announce that in honor of its partnership with Mission Hospital won the Giving is Living Award at the Spirit of Volunteerism Awards hosted by OneOC. They were able to help provide 10 procedures, making a huge positive impact in the lives of our patients! On October 8th, 2016, Mission Hospital partnered with AccessOC for yet another Surgery Day. On October 1st, 2016, Kaiser Permanente OC Anahiem/Kraemer Medical Center partnered with AccessOC for a Super Surgery Day.